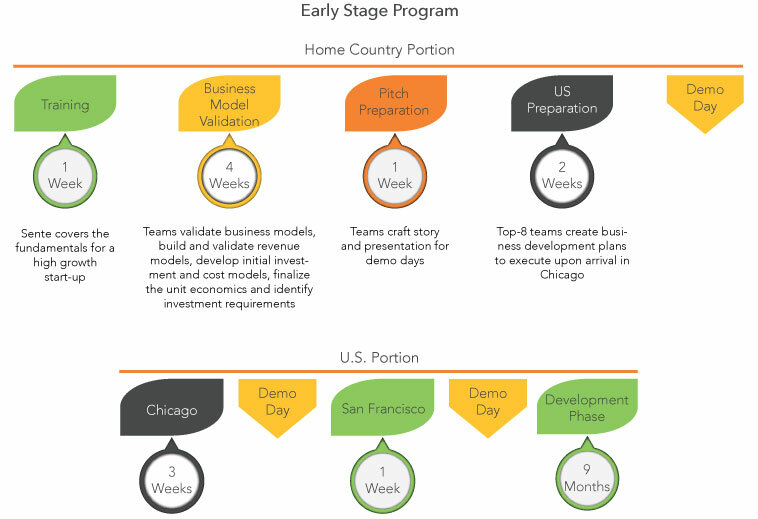 The Early Stage Program is for companies that have their product commercially ready for global opportunity and are either in beta or have paying customers. The team has been formed and those core team members must be fully committed to the program. There will be 20 companies participating in the home country portion (2 months), which will end in a local demo day. From there, 6-8 teams will be selected to continue stop the US for one month - 3 weeks at 1871 in Chicago and 1 week in San Francisco. Teams leverage 1871 and Sente resources, mentors and networking events in both Chicago and San Francisco to improve business models and contact potential customers, partners, and investors. They will each present their progress at a demo day in both cities.